America is still suffering with the outbreak of Zika virus (ZIKV) infection. Congenital ZIKV syndrome has already caused a public health emergency of international concern. However, there are still no vaccines to prevent or drugs to treat the infection caused by ZIKV. The ZIKV NS3 helicase (NS3h) protein is a promising target for drug discovery due to its essential role in viral genome replication. NS3h unwinds the viral RNA to enable the replication of the viral genome by the NS5 protein. NS3h contains two important binding sites: the NTPase binding site and the RNA binding site. Here, we used molecular dynamics (MD) simulations to study the molecular behavior of ZIKV NS3h in the presence and absence of ssRNA and the potential implications for NS3h activity and inhibition. Although there is conformational variability and poor electron densities of the RNA binding loop in various apo flaviviruses NS3h crystallographic structures, the MD trajectories of NS3h-ssRNA demonstrated that the RNA binding loop becomes more stable when NS3h is occupied by RNA. 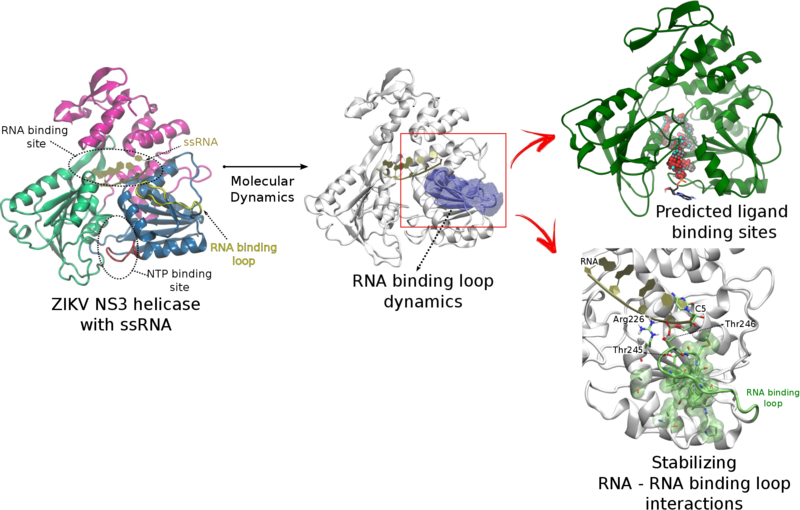 Our results suggest that the presence of RNA generates important interactions with the RNA binding loop, and these interactions stabilize the loop sufficiently that it remains in a closed conformation. This closed conformation likely keeps the ssRNA bound to the protein for a sufficient duration to enable the unwinding/replication activities of NS3h to occur. In addition, conformational changes of this RNA binding loop can change the nature and location of the optimal ligand binding site, according to AutoLigand calculations. These are important findings to help guide the design and discovery of new inhibitors of NS3h as promising compounds to treat the ZIKV infection.